All transactions are safe and secure with a reliable history in online purchasing behind each of our associates. 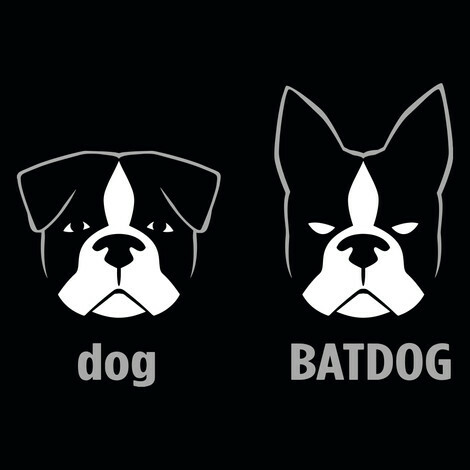 Buy the Batdog t-shirt to own Batman clothing and merchandise. If you're feeling too innocent for a Dark Knight Joker t-shirt or too modern for vintage Batman apparel, this Batdog shirt offers an animal-friendly take on the superhero. The design on this Batman clothing item features Batdog and his alter ego, dog. We don't imagine he would get along well with Catwoman. Wear it for a humorous twist on the Caped Crusader. Pair it with the Dark Knight Batman t-shirt that displays an image of Gotham City's "Why So Serious?" Joker holding up a playing card with an image of Batman on it. In addition to the Batdog tee above, browse the Batman Clothing Gallery for more apparel like men's and women's clothes, kids shirts or hoodies.